Macron greeted Xi at Paris's Arc de Triomphe war monument, ahead of talks and a state dinner at the Elysée Palace. 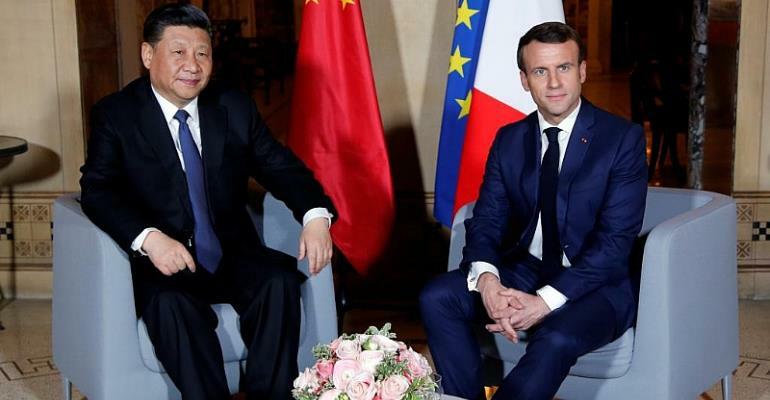 Macron will be looking to take a firm line with China – after Italy defied warnings from the rest of Europe and joined Beijing's massive Belt and Road infrastructure project intended to link Asia to Europe. His view is shared by the German Chancellor, Angela Merkel, who will join Macron and Xi for talks on Tuesday with EU Commission chief Jean-Claude Juncker. It's hoped Europe and China can explore areas of shared interest ahead of a summit in Brussels next month. Warnings that Chinese investment is buying Beijing too much influence in Europe are misguided, says Martin Jacques, author of When China Rules the World – who sees China as the key to Europe's prosperity. “Europe's in trouble. It's hardly growing and it needs to embrace the growing parts of the world – starting with China,” Jacques says. “There's no question that Europe as a whole, and in this context western Europe, has to look to a new kind of relationship with China. Watching China rise to become the most powerful economy in the world isn't a reason for worry for Jacques, who says the backing of Chinese companies by the Beijing government points to a difference of culture, and not a desire to create an unfair marketplace. “We've got to learn that China is different, and we can't just insist on it operating on Western/European terms. China has different roots and a different history. Its remarkable transformation has been a product of an economic policy called 'Reform and Opening Up', which has involved a very competitive market combined with the very important involvement of government.